You start by booking the car you want through AutoSlash instead of a car rental site. They will give you the best deal they find for that car and book it for you. Don’t be afraid, it’s free and you can cancel anytime if you change your mind. That’s it. Ha! But really, it’s that simple. After you’ve booked your car, Autoslash will then constantly look for discounts, promo codes, and better deals for that car and re-book you with a better deal. They won’t stop looking for better deals clear up until you’re at the counter paying for it. So I re-booked my mini van and they gave me the rate of $612. Within THREE hours, I already had an email from them saying they found a better deal for $552 (Savings of $59.86). Within a few days they found me an even BETTER deal for $518 and I was saving $94.49. In the end I ended up with Hertz paying $448.74 and saved a grand total of $163.77 and even more if you count the $700 I had started out with on my own. I’m a paranoid person, I’ll admit. So I felt a little worried about if I really had a booking with these rental car companies. 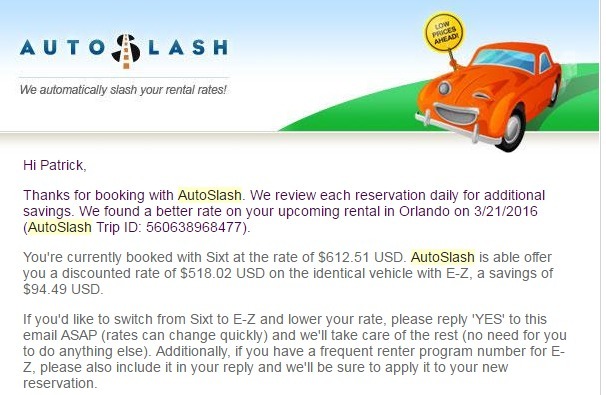 So I took each of the confirmation numbers that AutoSlash gave me and I would put it in on the site of the actual rental car company that AutoSlash booked me with. It showed up every time, showed the discount that was applied, and the price that AutoSlash had given me. 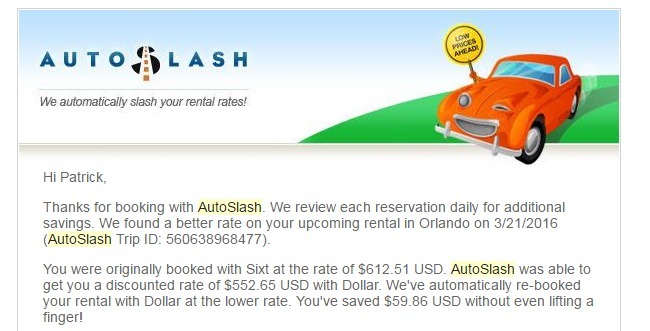 I never had to worry about canceling past bookings or re-booking new ones, AutoSlash did all of that for me. When we showed up to pick up our rental car, we gave them our confirmation number and off we drove, with extra money in our pockets! My sister booked a Ford Focus for 6 days in Florida using AutoSlash for originally $426 and by the time she picked up her car, she had gotten it down to $177. 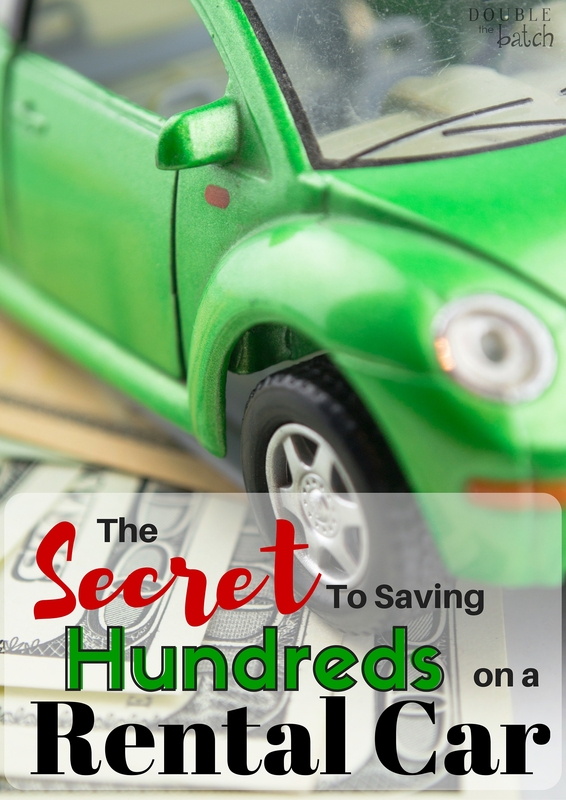 A savings of $248! My friend came to me discouraged because she was looking at a car for over for 4 days in Virginia and it was going to cost her over $700. I told her about AutoSlash and she decided to book with them and change their trip to 13 days! She also had an AAA membership so she was able to book her 13 day trip for $340 on AutoSlash and by the time she left they had gotten her price even lower to $190.82!!! That’s a savings of over $500 for 13 days! Now before you think this is too good to be true, (I promise, it’s not) you should know that you still need to do a little research when booking with any rental car company. Some companies, like Budget and Dollar, don’t have that great of reviews and thus offer some great deals. That doesn’t necessarily mean you shouldn’t book with them (totally up to you! ), it just means you should do some research and read other people’s reviews to see what to be prepared for. I decided to stick with Hertz when Dollar was offered but my sister went with Budget, came prepared, and was perfectly content with her car. So there you have it! Check out AutoSlash yourself and tell me what you think!